So today I got the privilege of reviewing some new earbuds from a company called PureBuds. They’re great little earbuds, there’s no doubt about it. Now, to expound upon my very general and uninformative initial sentence…. These earbuds are really cool looking; the actual buds themselves. The white cord it comes with honestly, kind of looks like the kind found on cheap $5 earbuds you buy at the counter of Fry’s…. But that’s not what matters when reviewing any sort of audio technology. As for actual audio these things produce, it’s amazing really. I put ’em in to listen to some Pantera on the way home from Starbucks and at first I was a little disappointed at the quality, but when I thought about it, it most likely had something to do with the actual audio file quality…. seeing as how I usually resort to no-to-legal sources for my music downloads. Let me tell you, a bit torrent is radio static compared to, let’s say, an original LP recording. But I digress….. These new earbuds feature what’s called “reverse sound technology” which basically means the speakers inside don’t directly face your eardrum like conventional earbuds or headphones. The speakers in these face back and are then reflected somehow back down into your ear canal where it is then mixed with less delayed sound to produce a very realistic surround sound type experience. 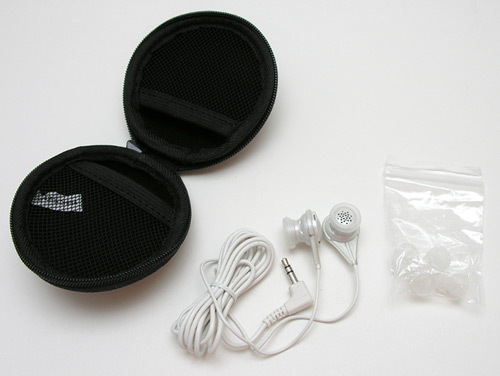 The tips which come with the earbuds give you the option for full tonal range, bass boost, or surround sound. I find that I personally like a more heavy-hitting bass sound in with almost all kinds of music, so I first tried on the bass boost and found that what it seemed they were doing is dampening the mid-range and to a lesser extent the highs thereby giving the illusion of the bass being “boosted” which is to make up for the lack of bass kick these have. The full tonal range tips came next and I was nonplussed. While these deliver a very clear, and brilliant sound, again, they do not provide quite the bass I so desire. Long story short, these tiny music blasters are great on clarity and tonality, but lack somewhat in the ghetto-blasting, rearview-shaking, and general ear-thumping bass one could hope for.